GLR Kolaqua is a stunning dark silver grey 4P Condor grandson out of the only Condor daughter Brad and Jandy have ever kept on their ranch. His mother GLR Amelita, is a grey appaloosa who was the 2004 AAA Futurity Grey Female Color Champion. 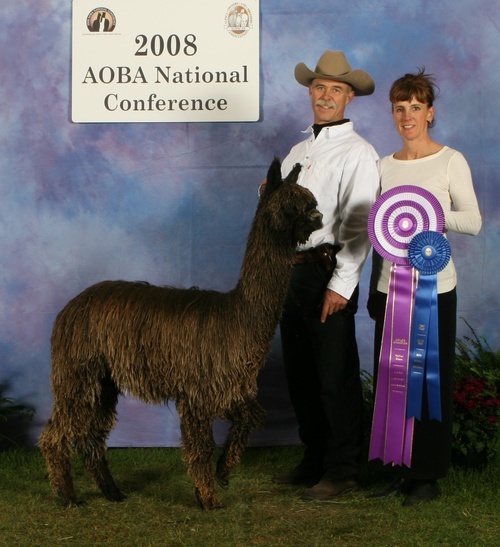 Kolaqua was the 2008 Grey Male Color Champion at both Mapaca and AOBA Nationals in Sandy Utah and won the 2009 AOBA Grey Male Color Championship in Cleveland. He is dense and greasy to the touch, has great luster, bone, a beautiful head and the mellow temperament of his papa, Synergy. His shear weight was an impressive 11.8 pounds! 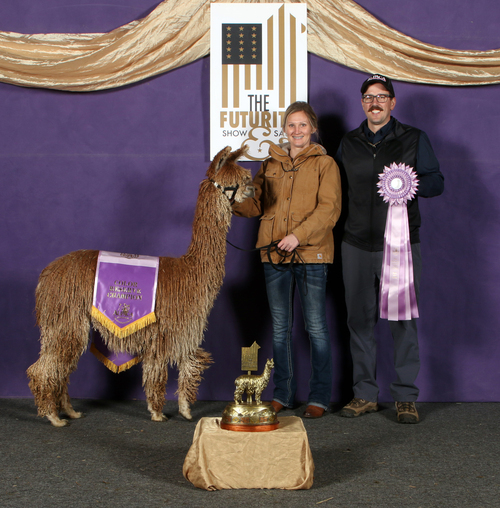 Kolaqua has two full siblings who are both multiple grey color champions as well: GLR Coyhaique, 2007 Mapaca Male Grey Color Champion, and 2007 AOBA Nationals Reserve Grey Color Champion, and GLR Atacama, 2009 AAA Futurity and MAPACA Grey Female Color Champion, and 2009 AOBA Nationals Grey Female Color Champion. Kolaqua started breeding in 2009 and and now has many seasons of offspring on the ground with plenty of blue ribbon and championship banner winners to his name. Two of his 2012 kids were GLR Rockoro, and GLR Tashina, who traveled with us in 2013 as members of our show string. 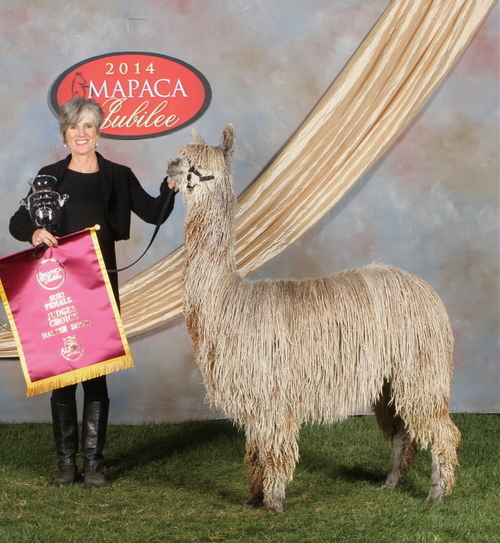 Rockoro was the 2013 Reserve Grey Male Color Champion at both MAPACA and the AAA Futurity and the AOBA Nationals Grey Male Color Champion as a juvenile. 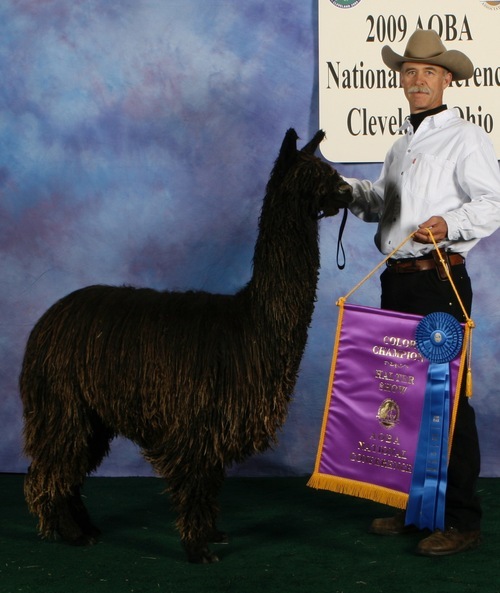 GLR Tashina as a juvenile was the 2013 Reserve Grey Female Champion at both Mapaca and the AAA Futurity, and in 2014 was the AOA Nationals' and the AAA Futurity Grey Female Color Champion, and the first alpaca to win a Grey Judges Choice award ever. His 2013 cria, GLR Taj, was the last to be born in November that year and too young to show .He may very well be the best grey cria we have ever produced. He was born with wrinkles all the way down his neck and back and his luster is remarkable. His micron test came back at a little over two years old as a 19.3. We are very pleased with how he and all of his siblings have matured. 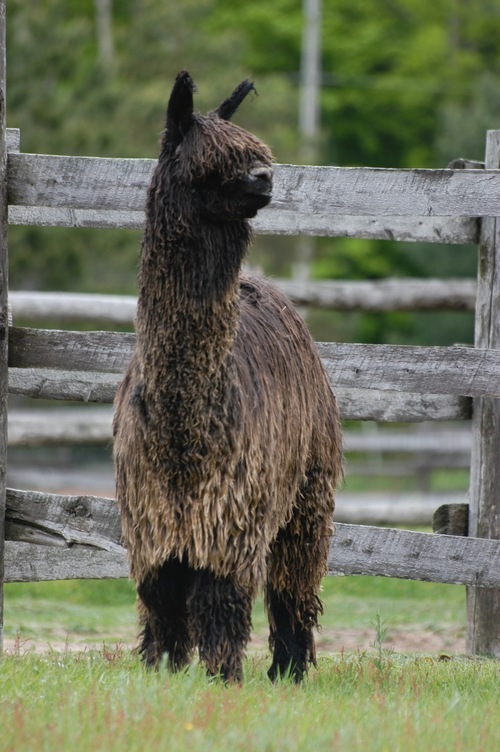 Kolaqua keeps producing awesome cria both grey and colored with excellent fiber and beautiful conformation. He is certainly a ranch favorite with his mellow disposition too! 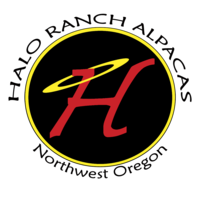 Next up and coming star!